While tossing them in the trash is quick and easy, there are plenty of more sustainable ways to dispose of coffee grounds. See if there's a local curbside composting service available, or make your own compost heap. You could also reuse your grounds for a variety of household projects. Whichever method you go with, just remember to keep used grounds away from drains, as they’re a common cause of clogs and septic tank issues. Toss coffee grounds in the trash if you want the easiest solution. For a no-fuss solution, just throw your grounds in the garbage as you would any other non-hazardous household waste. As a bonus, coffee grounds can absorb odors, so they might help keep your trash from smelling bad. While you can just throw grounds in the trash, there are a variety of ways to reuse them. Reducing the amount of trash you send to the landfill is good for the environment. Keep your used grounds away from sinks and toilets. 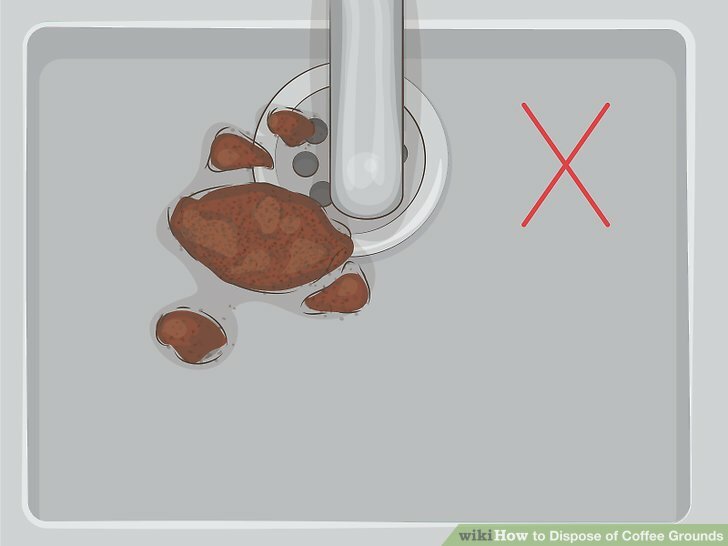 Never dispose of coffee grounds by pouring them down a sink or flushing them down a toilet. They collect in the drain and are a common cause of clogs. Additionally, coffee grounds can cause major septic system problems, so keeping them out of your plumbing is especially important if you have a septic tank. See if there’s a local curbside composting service. In some areas, government or private companies provide bins for compostable food waste, including coffee grounds and filters. Search online to see if this service is available in your area. You fill the bin up with compostable waste, then they pick it up and replace the filled bin with a fresh one. 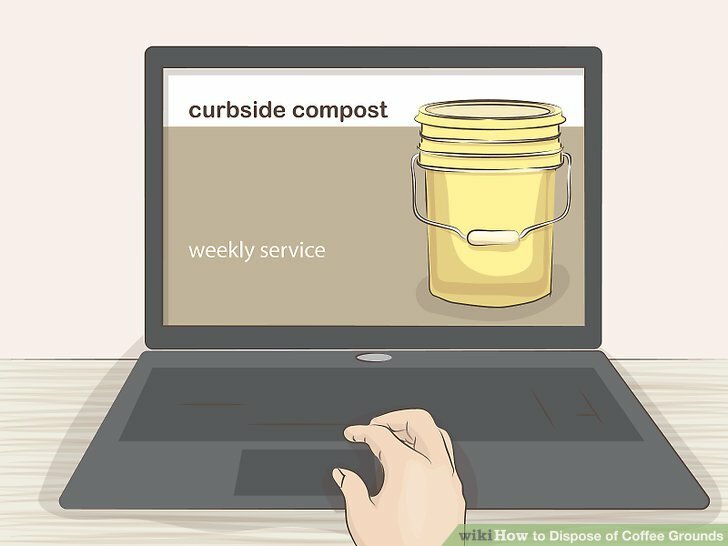 If you don’t want to pay for curbside composting service, you can also make your own compost pile. Place a lidded bin in a shaded dry spot. To deter pests and protect your heap from the wind, cover your bin with a lid or tarp. 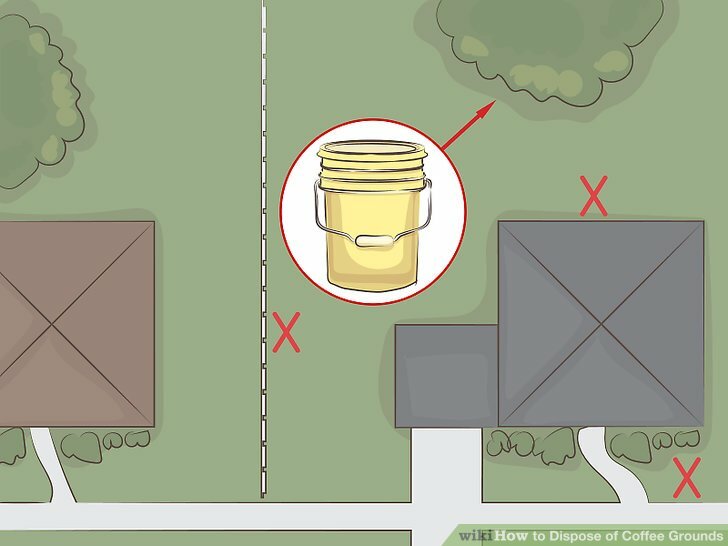 Keep the bin in a shaded spot in your yard, and make sure it’s far enough from homes and property lines to comply with your local codes. For instance, you might need to keep the bin at least from homes and drainage ways, from property lines and fences, and out of sight from the street. Check your city or county government website for your specific local regulations. Start with a layer of course branches and twigs to promote air flow. For the first layer, cover the bottom of the bin with woody materials. That way, the bottom of the heap will still be able to breathe after you’ve added layers of denser materials, such your used coffee grounds. Add a layer of leaves and yard clippings. Rake your yard, mow the lawn, and prune your bushes so you’ll have material for your heap's next layer. Leaves, grass clippings, and other organic yard debris will provide your heap with sources of carbon. Toss in coffee grounds, fruit and veggie s****s, and eggshells. 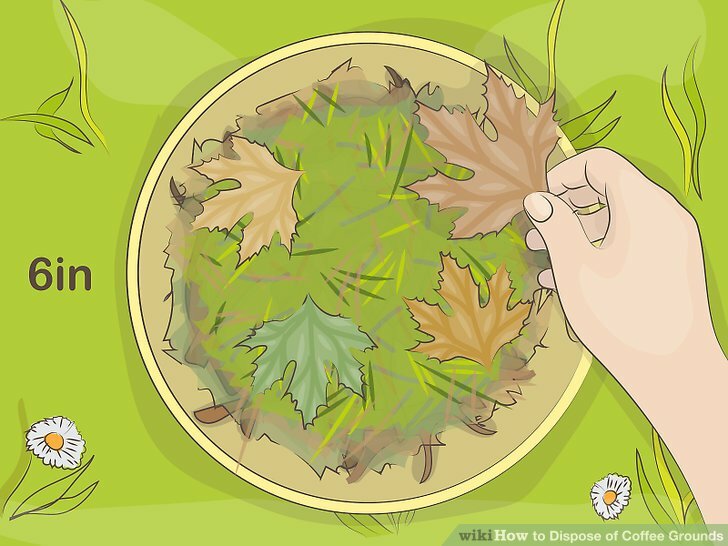 After the leaves and grass trimmings, add any stems, peels, rinds, eggshells, nut shells, vacuum cleaner bag contents, and coffee grounds you have on hand. Mix them up with the grass and leaves, then water the heap. Just get the heap damp; you don't want to flood it. 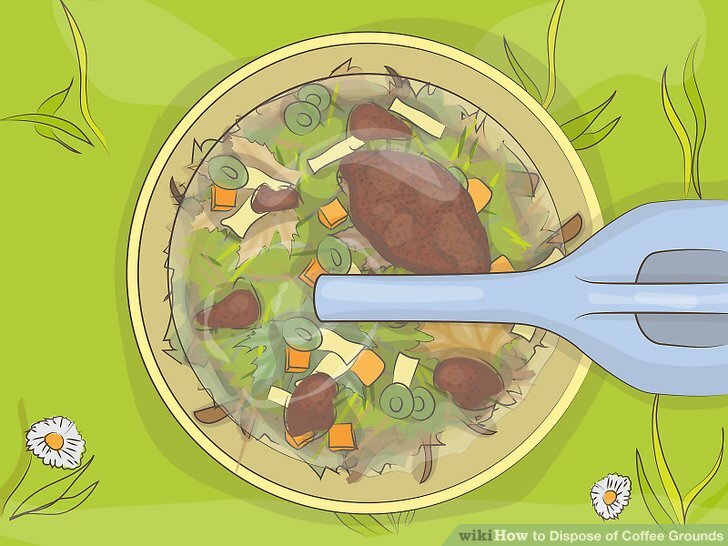 Don’t compost meat or bones, animal fat, dairy products, diseased or insect-infested plants, yard trimming treated with chemical pesticides or herbicides, or pet wastes. These substances can create pest problems or render your compost harmful to plants, pets, or people. Dampen the pile when you add dry materials. Try to keep the pile moist enough so its surface glistens. You want it damp, but not soggy or flooded. Water it whenever you add new layers or if it starts to dry. In dry conditions, you might need to water it several times a week. To prevent runoff, dig an indentation in the center so the sides slope gently toward the middle of the pile. 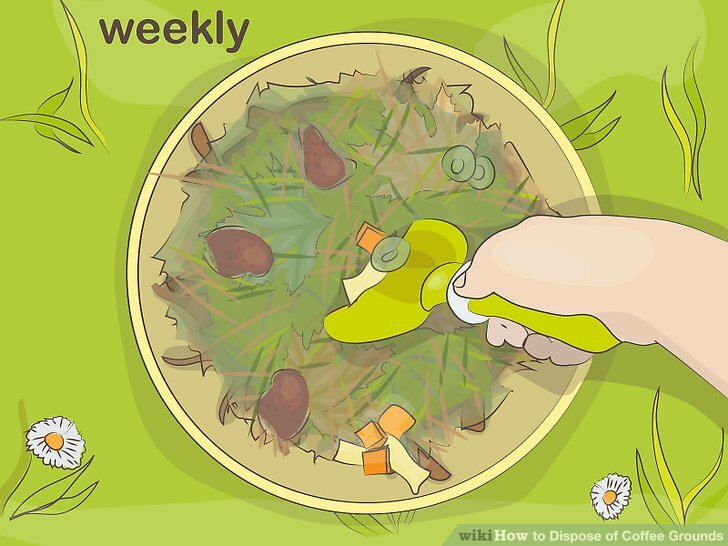 Turn the pile weekly to speed up decomposition. When you add new layers, mix them into the compost pile instead of just scattering them on the top. Cover the newly added waste with about of composted material, and remember to reshape the indentation at the center of the pile. Turning the pile will help break down waste faster. After at least 3 to 6 months, the bottom of your heap should break down into a dark, crumbly soil that you can use to fertilize your plants. Dry any coffee grounds you’re storing to prevent mold growth. 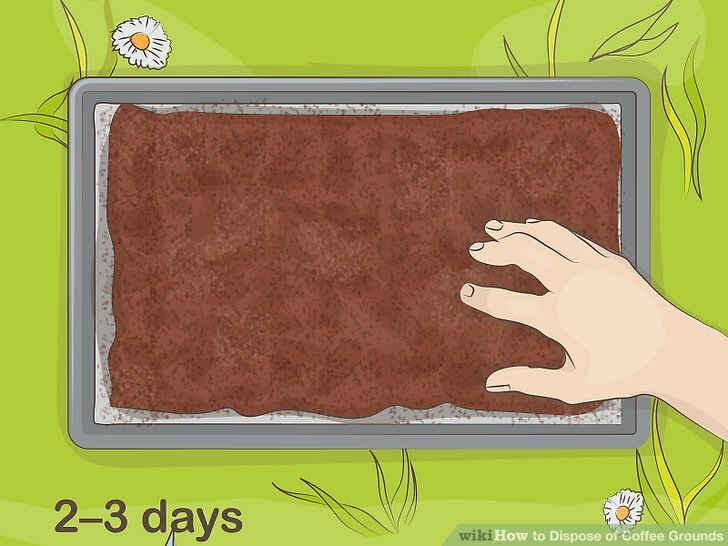 Cover a baking sheet with newspaper, and scatter the grounds in a layer no more than thick. The thinner you spread them, the faster they’ll dry. If conditions are dry and sunny, let them sit outside for 2 to 3 days to dry. Alternatively, you can dry them in the oven at for a total of 20 to 30 minutes. Every 10 minutes, rotate the baking sheet and check to see if they’re dry. Wet coffee grounds promote mold growth, so any that you’re storing for reuse need to be dried. Scrub stubborn buildup with a small amount of grounds. Since they’re abrasive and acidic, coffee grounds are good at scrubbing away residue on pots and pans. Keep in mind coffee grounds can leave behind a brown tinge, so make sure anything you clean with them is stain-resistant. Remember that coffee grounds can clog a drain. If you use grounds to scrub a pot, use a kitchen sink plug with a fine mesh drain basket to collect the grounds, then throw them in the trash. 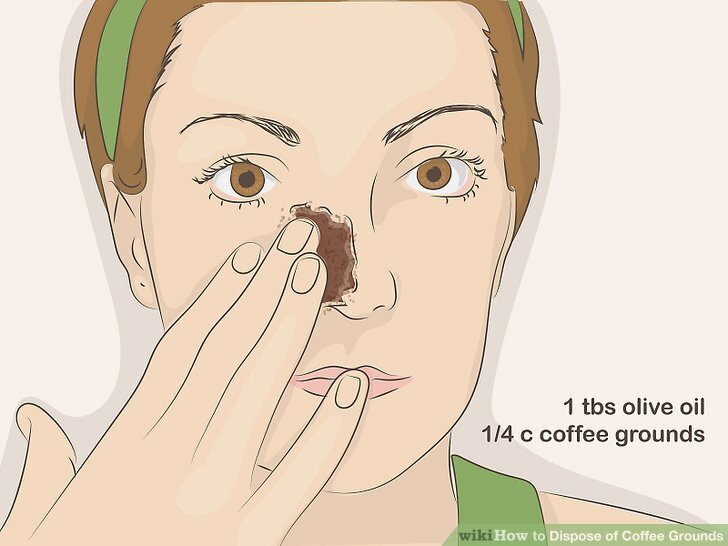 Try exfoliating your skin with coffee grounds. For a moisturizing, exfoliating scrub, mix a tablespoon of olive oil with of used coffee grounds. Massage your face and any areas of dry, flaky skin, then rinse off the grounds and oil with lukewarm water. If you have oily skin, skip the olive oil. Just massage your face with coffee grounds, then rinse. A teaspoon or so of grounds here and there won’t clog your drains, but you still shouldn't get in the habit of pouring them down the drain. For larger amounts, like , you'll definitely need to collect the used grounds with a drain stopper instead of letting them go down the drain. Soak used grounds in hot water to make a dye. Grab your coffee filter filled with used grounds, tie it tightly with a rubber band, then soak it in of water. Steep it for 10 minutes, or longer for a deeper color, then mix in a teaspoon of vinegar to set the dye. Use your sepia-toned dye on paper, fabric, clothes, for touching up worn brown furniture, or to color your hair naturally. 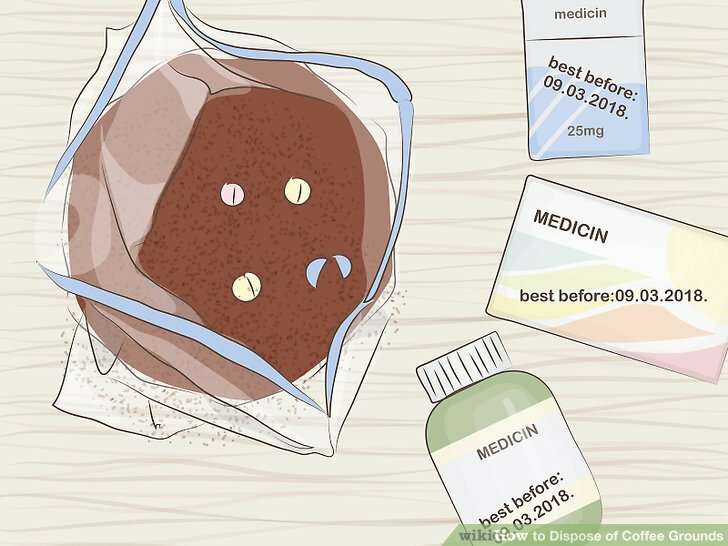 Mix expired or unneeded medicines with used coffee grounds. The best way to dispose of medicines is with a community drug take-back program. However, if that’s not an option, you can also throw them out with coffee grounds. Put the medicine in a sealable plastic bag, fill the bag with used coffee grounds, then seal the bag and throw it in the garbage. Keep in mind that the best option is a take-back program. Contact your local pharmacy for information about local take-back programs. If none are available in your area, consider using the coffee ground method. Always dispose of narcotic pain ****ers and other commonly abused prescription drugs through a take-back program. 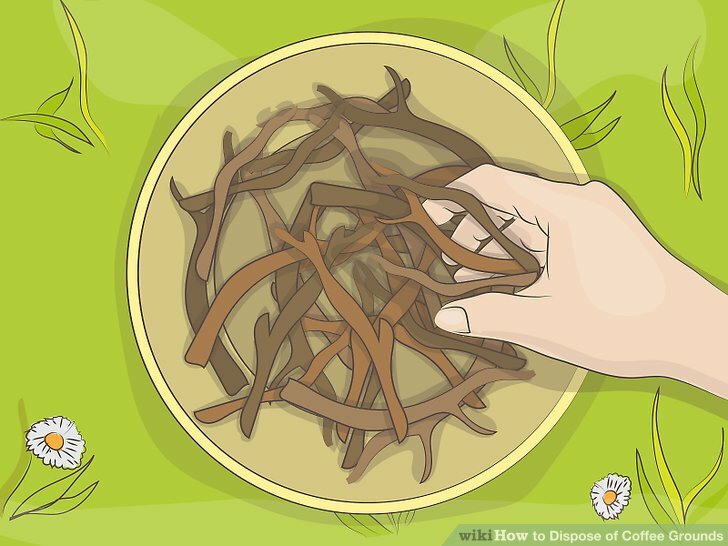 Avoid adding coffee grounds to your soil without composting them first. Though some people advocate adding them to soil, coffee grounds can promote mold, and there’s no evidence that they benefit plant growth without first being composted.